California Dance Company’s Intensive Program allows our most dedicated dancers to travel the state performing and competing against hundreds of the most talented dancers in California. Our Intensive Program teaches our dancers more than just dance; they learn what can come from hard work, dedication, and group effort. They spend a year with their teammates learning choreography, perfecting technique, and traveling the state together pouring everything they have into each performance. This team turns dancers into family, and gives them the means to become top-tier performers. Auditions are held at our Anderson location. 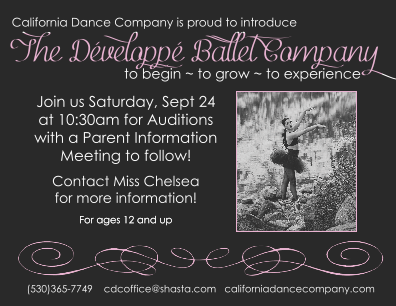 An informative Parent Meeting will take place before audition forms are released to go over the process, what being an Intensive Program Dancer entails, and answer any additional questions. Our Performance Team is the face of California Dance Company in our community. These dancers will learn routines, order costumes and warm ups, and perform at all of our community events, such as Toys for Tots and Market Fest! Auditions are held at the beginning of each dance year during the free workshop. Join our Fall Session by attending our free workshop in September, with a parent meeting to follow.